Of all the motorcycles to have graced the world's race-tracks over the years, there have been few so emotive as the 'Manx' Norton. Throughout the '30s, Norton were nigh on unbeatable at the Isle of Man 'TT'. Their top roadster at the time was the 'International'. It was the production racer based on this bike that was first to sport the 'Manx' badge. However, it was not until 1950 that the most memorable Manx Norton of all arrived on the 'island'. 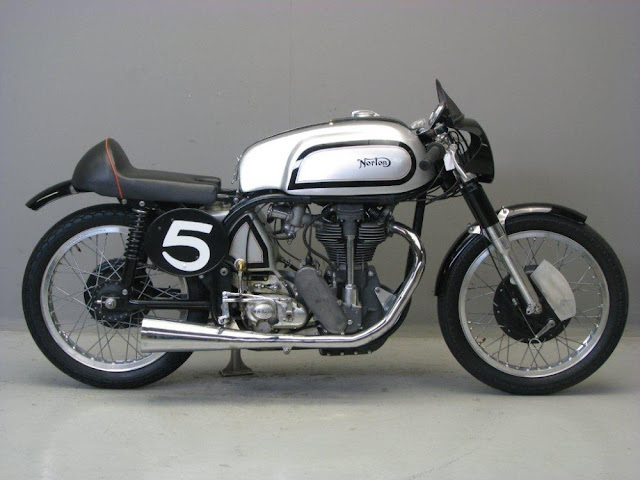 So supple was its frame that one of Norton's aces likened it to riding a feather bed! His words stuck ... it was dubbed the 'Featherbed Manx'. But a great bike still needs a great rider. And riders do not come any greater than Geoff Duke! A perfect fit for the Featherbed, in '51 Duke took both the 500 and 350cc world championships. Supreme sportsman that he was, Duke would have been first to acknowledge the part played by Irishmen Rex and Cromie McCandless. They were the legendary engineers who designed the flexible Featherbed frame. Nowadays, it seems inconceivable that a bike as successful as the Manx could have been a single-pot 'thumper'. Air-cooled, four valves, 54 bhp - a far cry from the 'rocketships' of today! Indeed, it would be the first four-cylinder forays at the TT - by Gilera, and MV Agusta - which would finally see off Manx indomitability. What to do, then, with such a machine - once its glory days are behind it? Sell it for scrap ... its famous frame fetching the going rate for steel? Thankfully, not! Glorious single-cylinder sounds can still be heard at classic race meets to this day ... as the majestic Manx Norton swoops into sight, on its way to completing yet another lap. Basso profundo, basically!